If you are a night owl, you should know that you can plant your own moon garden and get in touch with Nature during the night. Namely, there are beautiful plants and flowers that bloom at night, and their soothing aromas can fill in your bedroom while you sleep. Angel’s Trumpet: It has trumpet-shaped, white flowers which open at night. Night Gladiolus: It is not nocturnal, but its creamy yellow flowers smell the strongest at night. Queen of the Night: Queen of the night only blooms once every one or two years, but the nocturnal cactus can open several large flowers at once on summer nights. 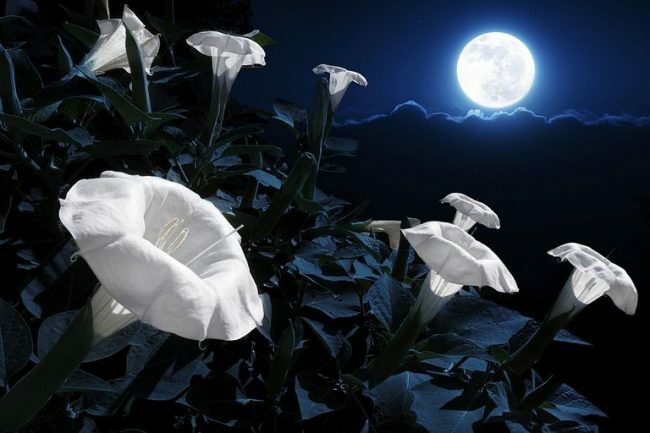 Moonflower: It blooms at night and releases a slightly lemony scent when it opens up. Its flowers are about 5 – 6″ in diameter and are tightly shut during the day. Evening Primrose: This perennial has pale pinkish-white flowers, with a pleasant aroma, and spreads rapidly. Night Phlox: They open up at dusk, and their aroma is similar to the one of honey or vanilla. Evening Stock: Its tiny purple and pink flowers smell divine when they open at night. Japanese Wisteria (Perennial): This plant can take several years before the white or lilac clusters emerge, so in order to plant it, purchase one that’s already in bloom. Dragonfruit Cactus: the beautiful, exotic dragonfruit comes from a night-blooming cactus, and its flower only opens up for a single night before withering the next morning. You can harvest the flowers that have blossomed under the energy of a full moon, dry them and use in talismans or charms, add them to a purification bath or incense blends.